Repair & Restore ! Have you heard about IPL? One of the best offers of the year! Heard about IPL? Reverse the damage from the sun & aging. 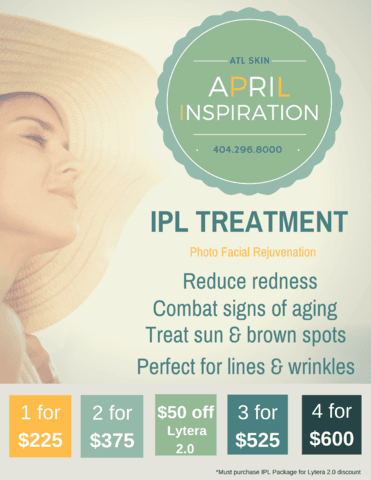 Call 404-296-8000 to take advantage of our April IPL Offer. Want to know more about IPL? 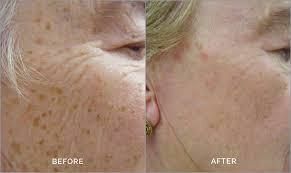 Look below to find out how IPL can be a skin changer! Do you think that the reflection you see in the mirror each morning matches the way you feel? Many patients wish that there was a safe, easy and quick way to get rid of their red complexion, fine wrinkles, irregular pigmentation and large pores. Fortunately, our advanced technologies enable us to treat these skin imperfections safely, easily and effectively. Dr. Jerry Cooper & his staff of Skin Experts perform IPL Rejuvenation for patients throughout metro Atlanta, to combat the effects of aging and damaged skin in a softer, gentler way. The redness and flushing of rosacea can be reduced 80 - 90 percent. It can be used to treat the full face, neck, chest and even the hands. Using the advanced IPL system, your SKin Expert gently delivers precise amounts of light energy through your skin's surface. Treatments are spaced at 3 week intervals. The energy is delivered at specific settings for each treatment to maximize your results. 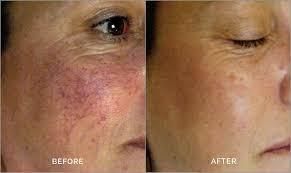 How Do IPL Photo Facial Rejuvenation Treatments Work? Today's new light technology delivers precise dosages of energy to the skin. During your treatment, light energy is gently delivered through a special handpiece to the targeted area. Levels of energy specific to your treatment are used to maximize your improvement. Once delivered, the light energy is absorbed by the targeted damaged tissue. Depending on the area treated, there will be a series of 4-6 treatments. Treatments usually take from 15 - 30 minutes and are administered in our ATL SKIN office. Does IPL Photo Facial Rejuvenation Hurt? It can be uncomfortable, so topical numbing cream is applied to minimize the pain. After treatment, there is no discomfort or downtime. Are IPL Photo Facial Treatments Safe? After our Skin Experts perform your IPL Photo Facial, post-operative discomfort is almost nonexistent. After treatment with most light systems, the treated skin may appear a little flushed and capillaries may seem to be more visible. The flushed look soon fades away, and the capillaries appear to vanish, leaving the skin looking younger. It's that simple. Following any treatment, you should follow your doctor's instructions, avoid any harsh skin cleansers and use sunscreen.